Keeping your head and facial hair neat and tidy on a regular basis takes a lot of time and commitment. Not to mention how often you need to do small shape-ups to keep the exact look that you prefer. If you leave that maintenance to the professionals and constantly visit the barber shop, it can add up to a very hefty sum pretty quickly. 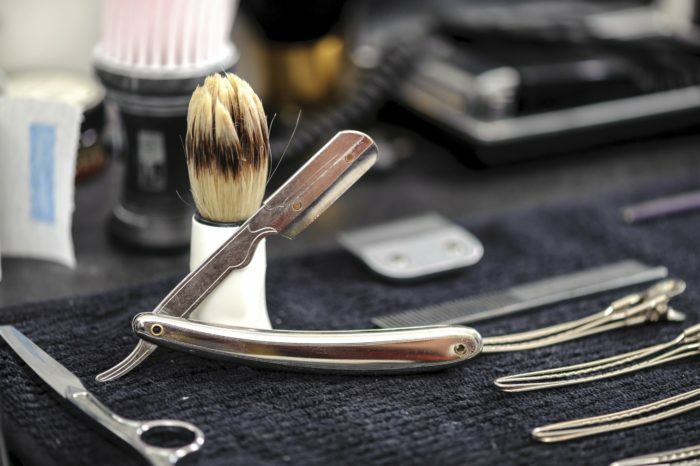 Investing in a pro barber kit is a great way to lower your costs while still being able to maintain your look. What comes in a Professional Barber Starter Kit? If you’ve always left your hair work to professionals, then you may not be very familiar with what tools you need. A pro barber kit will come equipped with everything necessary to facilitate a barber shop experience from the comfort of your own home. Since most barber kits you will find are designed for at home use, you will not find kits that include every piece of equipment you might see when you visit the barber, but rather the essentials that are easy for anyone to use without training. Clippers: this is the most important tool to have in your at-home barber kit. You want clippers that are good quality and functional for different needs. Comb Attachments: every area that you will be targeting cannot be handled with the same comb. Your kit will provide you with various combs of different sizes. Blade Oil: for proper upkeep, you need to oil your clippers’ blade after every use. Cleaning Brush: other than oiling, brushing your clippers will help keep them clean and in good condition. These basic tools will set you up for what you need to recreate the barber shop at home. The best barber clippers will be the ones that have the most effective combination of features that create a professional hair trimming experience. Different features will matter more depending on specific needs. Blades: quality and adjustability are what you should pay attention to when checking out the blades of clippers. Motor: you want to make sure that the motor of your clippers will be strong enough for the job. Cord Status: think about whether you want a corded or cordless trimmer. Sharpening: how will the blades be sharpened. Do you need to do it yourself, or are they self-sharpening? Differences in these features in clippers may influence the final choice you make, so think about them beforehand. To speed up your search, cut right to the top 5 options, which can allow beginners or veterans to get something informational or new! When you choose Remington, you choose a brand that is highly relied upon and provides affordable and high-quality products. Their barber kit meets those standards and sets you up for your home barber shop experience. The 13-piece kit supplies all necessary tools including blade oil and a cleaning brush. Remington’s stainless-steel clipper blades are versatile and can be used to trim and shape all hair textures. With the contouring blades and 9 comb attachments, you have full control of your styling. Trim anywhere you want with the cordless clipper, which provides 40 minutes of continuous runtime. Click here to see the pricing for the Remington HC4250 Hair Clippers on Amazon. If you’re looking for the most extensive barber kit available, you’ll be happy with Wahl’s home set. It contains 30 pieces, including 3 different professional clippers with specific uses. The high-carbon steel blades of the clippers are durable and will stay sharp longer than other types of blades. With a quality pair of barber scissors and 12 different comb attachments, your home barber shop will run immediately. Even if you’re a beginner, you will feel safe, as Wahl provides step-by-step instructions. This kit will even get you on the way to trimming your nose hairs. Click here to read more about Wahl Clipper Kit on Amazon. Another reliable brand, Conair provides a full barber kit complete with clippers that have 55 custom settings. Always affordable, Conair gives you tools that are quality constructed and dependable. Everything about using this barber kit is simple, right down to cleaning. No need to worry about getting clothes too messy, you can use the included barber cape. The 10 different comb attachments provide flexibility in cut and styling. You can use your clippers anywhere, and once the trimmer is fully charged, it has 60 minutes of battery. Your kit will be easy to keep in good shape for years with the included storage case. Click here to view Conair Cord/Cordless Home Hair Cutting Kit on Amazon. Well known for their t-outliner, Andis offers the option of a barber kit that is a bigger investment in its quality that will last over a long amount of time. You’ll never need to worry about your trimmer’s noise level and the tool will stay cool to the touch. The combination of clipper and trimmer and their various comb attachments gives great flexibility. The close-cut results will be noticeable and consistent with any hair texture. Whether you want to plug into a standard wall outlet or power strip, your clipper and trimmer will perform just as well. Click here to read reviews posted about Andis Barber Clipper and Trimmer Combo Kit on Amazon. A great starter barber kit for beginners who want a professional-grade experience at home, the BuySSHow kit provides flexibility. With 8 comb attachments, 2 barber scissors, and a standard comb, styling will be a breeze. The ceramic-titanium blade will stay in great condition and sharp for years without rusting. The low vibration, precision motor ensures that operation will be quiet and basically unnoticeable for those who are close. Another affordable kit, this could be your starting option for your home barber shop. Click here to read reviews posted about BuySShow Professional Hair Clippers on Amazon.